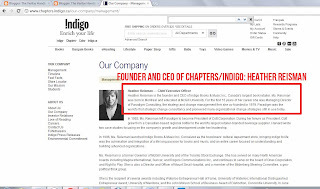 Chapters/ Indigo/ Coles bookstores are a large chain of bookstores across Canada. The CEO, majority share-holder and founder of the bookstore chain, Heather Reisman (and her husband) are also pro-Israeli activists. They have an intimate relationship with Israeli officials and more importantly, an intricate relationship with the Israeli military. To be highlighted is their founding of the organization "Heseg" for Lone Soldiers, in which foreigners who volunteer to serve in the Israeli Defense Forces are given full scholarships to live in Israel. Thus, Chapters has been the target of a boycott campaign as people of conscience refuse to buy from a company complicit in the war crimes against Palestiniians and one which encourages Israeli military culture. 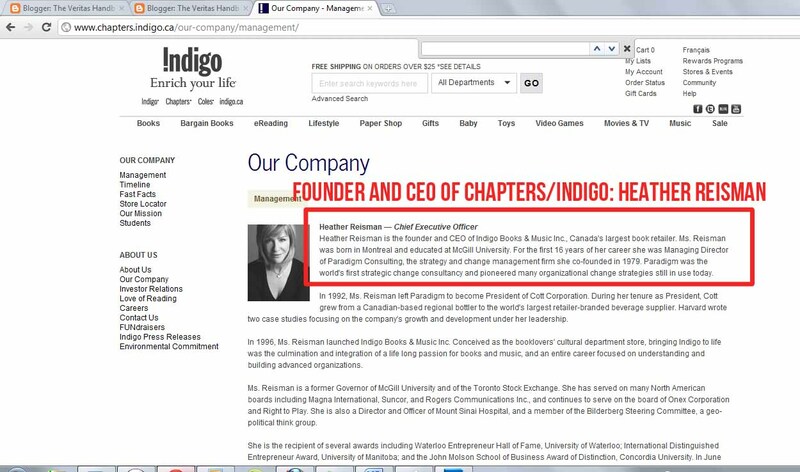 The CEO and founder of the Chapters Indigo bookstores is Heather Reisman. "The Lone Soldiers who sacrifice so much for the State of Israel embody the spirit of giving. They are the pioneers of the new millenium. We, at HESEG, salute them and extend a helping hand to enable them to remain in Israel, and obtain an academic education. We want to support their desire to continue to strive for excellence and to lead the State of Israel to new achievements in the future. This is the least we can do in order to reward their service to the state and help them continue to contribute to the community." "HESEG Foundation (HESEG) provides full academic scholarships and living expenses to former Lone Soldiers who have completed their service in the Israel Defence Forces (IDF) and have chosen to make Israel their home. Lone Soldiers are young men and women from all over the world, who come to Israel to volunteer in the IDF. These remarkable individuals leave their families and friends behind, and are driven by their ideals and commitment to Israel’s security and future." "She likens Israel to a diamond created from tremendously intense pressures; in Israel's case, she says, the pressures originate from hostile neighbours and the insatiable scrutiny of the world press. " "On the adjacent wall are photographs showing her with her husband and former Israeli prime minister Ariel Sharon, and with generals and dignitaries on Israeli military bases and airfields. They are a roadmap of her travels to Israel over the past two years. Reisman was born in Montreal in 1948 and says she's always had a strong attachment to Israel. She proudly raised money to plant fir trees in Israel as a Hebrew school student, hanging a picture of David Ben-Gurion on her bedroom wall as a teenager. "I always felt proud of being Jewish. I was always interested in Israel. Israel was just a part of who I was, and who I am, all my life," she says. When Reisman and Schwartz first visited Israel with their four pre-teen children, both vowed they would return "and find some way to be more engaged in Israel." " After hearing this story, Reisman and Schwartz decided to help. 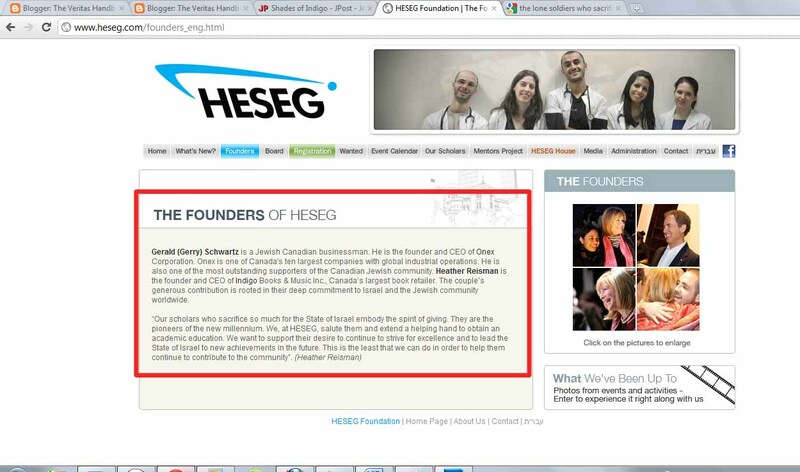 Six months later in Israel, they set up the HESEG Foundation, endowed it with several million dollars and assembled an impressive board of directors that reads like Israel's Who's Who. They are now planning to give HESEG permanent visibility in Israel by building HESEG House, a soon-to-be constructed drop-in center that will act like a campus for HESEG scholars. " "Vice-Premier Shimon Peres said of Schwartz and Reisman, "You are helping today, some of the best young Jewish people, to escape their loneliness, so they will be able to help us escape our loneliness." "But the long-term is, "We are helping create a rich group of leaders to take Israel well into the 21st century." Reisman and Schwartz view HESEG as their single most important contribution to Israel. " "At issue is a charity Reisman and her billionaire husband, Toronto businessman Gerry Schwartz, set up in 2005. The Heseg Foundation provides bursaries and pays living expenses for former IDF members who wish to study and settle in Israel, but have no family in country. Headquartered in a historic Tel Aviv mansion, the foundation supports approximately 125 “Lone Soldiers” each year." "Israel is an emotional subject. A lifelong Liberal, major donor and former policy chair, she broke with the party in 2006 over interim leader Bill Graham’s stance on the Lebanon war. "